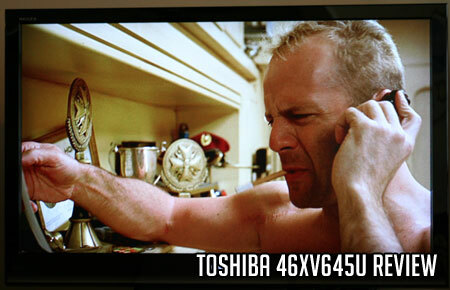 Calibration: The Toshiba 46XV645U is a perfect example of how calibration can be essential to picture performance. 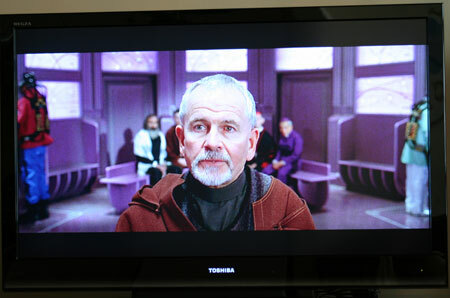 **Important Note: This TV comes out of the box tuned to Store calibration settings (100% Backlight and 100% Contrast). Tune to Home and follow the follow the following Picture Settings to Calibrate to D6500. For lighter room settings use these settings but increase brightness and contrast by 5 to 10%. 720p/1080i/1080p HD Picture Quality: HD picture quality on the Toshiba XV645 is appealing, but not close to the best we've seen. Colors were much more subdued than many LCDs we've tested recently – adding realism. The HD presentation with this TV doesn't create that incredible contrast pop that we have enjoyed lately with some of our favorite TVs. As mentioned below in the Viewing Angle section, contrast is impaired at angles so viewing the picture from straight on is important. This and the above shots from the Blu Ray of The Fifth Element shows saturated color but a light flesh tone presentation. 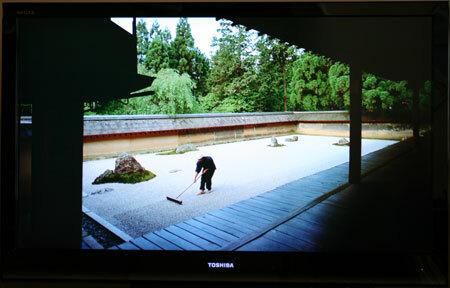 Up conversion from 480i: This picture quality test is importantly included due to its similarity with a cable or satellite non-HD digital signal. It's also a good test of this TVs 14 bit digital video processor. Black levels back off some compared to HD signals. There is more side to side jerky motion artifact apparent. With the right calibration softening up the picture some, it's not unbearable. 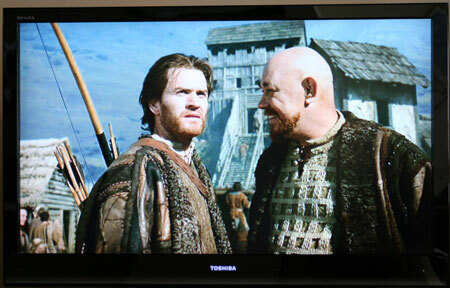 This natural outside shot from the 480i DVD Tristan and Isolde shows good brightness levels on the XV645U. Black Level/Contrast/Contrast Ratio: With HD content through HDMI input black levels appeared saturated from front and center. However at angles this was not the case, especially with 480i input (see viewing angles section below). As well, post calibration contrast measured an average 471 at varying backlight levels – a poor result. Black levels with 480i input was considerably lighter, especially at side angles. Dark Shadow Detail: Blacks were over saturated occasionally causing a deficiency in shadow detail. This shot from the Blu Ray Imax Blue Planet shows deep black saturation but weak shadow detail. Color Rendition/Color Accuracy: Flesh tones were less flush on this TV than many we've tested recently. Color information was not very saturated and lacked the pop we've seen on many recent LCDs – probably due to lack of contrast. Viewing Angle/Off Axis Viewing: The XV645 contains an effective anti glare screen which may contribute to side angle viewing issues. Black levels and contrast do begin to degrade early on this TV at around 30 degrees. The noticeable impairement gets worse as the viewing angle widens. Blacks get hazier as contrast is compromised, taking the punch out of colors. Motion Lag: There are jerky side to side motion artifacts visible especially with 480i signals. False Contouring/ Mapping: We did not note mapping and contouring issues with the Toshiba's picture. Features: This TV has 120Hz enabled frame rate conversion called Clear Frame which is best suited for sports programming. 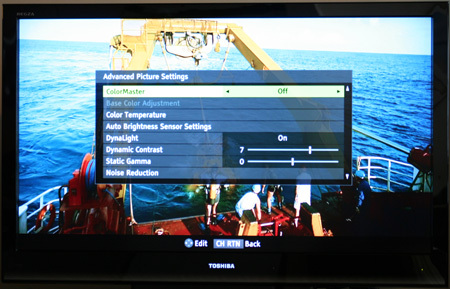 When using the TV in the Game picture mode, this feature is automatically turned off, so obviously Toshiba does not think it well suited to gaming. We usually recommend turning this feature off for film based programming though we did not notice the incredibly distracting background effects seen on some other 120Hz rate TVs. Other new features include FocaLight LED backlight technology which automatically adjusts the backlight on the LCD depending on room light conditions. This will extend the life of the TV if you choose to use the feature, but using our suggested calibration settings will do the same. With a 60,000 hour avg. life usage, as long as your not maxing out the contrast and backlight settings, it probably isn't a concern. A nifty new feature I enjoyed is the ½ mute feature, enabled by pressing the normal mute button on the remote. The feature cuts the volume output in half allowing you to somewhat continue to watch the program while attending to the incoming phone call, or hear the kids in the other room. Video Aspect Ratio Sizing: The picture size button on the XV645 remote controls video aspect options: Full, Theater Wide 1, 2, 3, Native, and 4:3. The Theater Wide 2 option did a nice job of algorithmically scaling The Fifth Element from 16:9 showing letterboxes to full screen without visible stretching. This is a nice set of options. Aesthetic Considerations: The XV645U is nice looking with less than one and half inch bezel frame width on top and just over that on the sides. The thin black frame is appealing. There is a unique silver/gray design element on the bottom of the TV that gives a slight 3 dimensional effect. The Toshiba logo is lit front and center bottom when the TV is on (may be turned off). The TV has a nice wall mounting depth of 3.6" with the input connections in a cavity to avoid adding more. The included table top stand comes attached to the TV, but does not swivel. Remote Control/Menu Funtionality: The 4 device universal remote is light and inexpensive feeling but has glow in the dark buttons and an ample set of option keys. The menu system is easy to use, however some of the more important options such as Advanced Picture Settings are well hidden and found by scrolling down to unseen areas in the Picture menu section. Once in Advanced Picture settings the user must continue scrolling down to unseen areas to access the important Clear Scan setting. Locating the Clear Scan feature in the menu to turn it off can be challenging. Audio Output: Sound output had a hollow, tinny note to it. Volume levels were not sufficient for a TV this size. The volume enhancement feature (found in Advanced Audio Settings) which we normally recommend, was in the On position out the box. This feature enhances voice based sound material. Not only did we not note an improvement with this feature turned on, voice output was very weak. This is one of those TV sound systems for which you will constantly tuning the volume up an down to hear voice, and turn down for surround volume. The 46XV645U is well priced for its size and feature set - currently around $1200. With picture quality, and quality of those features thrown in to the mix, that becomes a wash. This price doesnt blow away some of the competition. The Samsung LN46B550 is priced the same also has fluorescent back lighting but no 120Hz rate option. The LN46B650 has the 120Hz rate but is priced a good bit more at $1500. LG's 47LH55 LCD has the 240Hz processing and is priced about $100 more. So Toshiba wins the contest for best price for features comparison (no use even include Sony in the contest). LCD TV Reviews: Read in depth commentary, ratings and calibration settings for the latest LCD televisions.